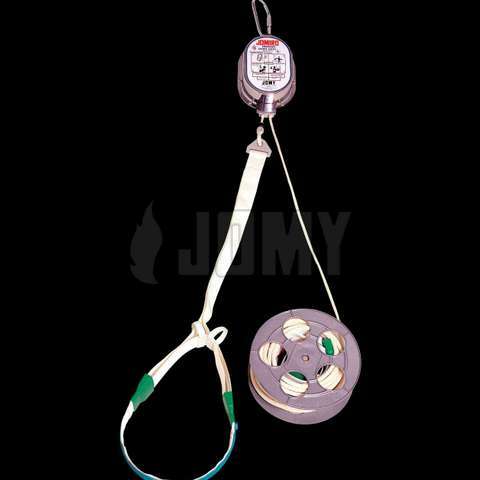 The JOMIRO descender system is a solution for individual fire evacuation when no means for collective evacuation are available. The device doesn't intend to compete with collective solutions such as egress stairs or ladders, but it is more an additional safety measure, or as an alternative escape route where a collective solution is not available. JOMIRO descent devices provide an individual evacuation option when there is no means for collective evacuation available. The JOMIRO descent system is an individual emergency means of escape. This product is not intended to compete with collective solutions, such as stairs or ladders, but as an additional safety measure or an escape solution where a collective option is not available. Using a cable and belt with a patented centrifugal brake, the JOMIRO descent system evacuates people with a controlled descent speed of 1m/s or 2.3 miles/hr. The brake provides a soft landing. While one person descends, a second belt, which is fixed at the other end of the cable, moves up and becomes available for the evacuation of the next person. The JOMIRO is compact (32cm x 18cm x 18cm) and light (4.6Kg). Within its steel casing, it is easily transported and suspended to the building. Different types of gallows are available. Worldwide, more than 280,000 JOMIRO descent systems are in use, for heights ranging from 5m - 50m.